I know that Albariño gets all the fame and much of the plaudits, but in the general run of things I am much happier drinking that other great white grape from Galicia, Godello. Albariño is a wonderful grape, but I often find that it disappoints unless it is very fine and costly. For a grape variety whose reputation is for high acidity, poise, elegance and being crisp, the cheaper versions can frequently be a bit soft and nondescript. Godello however is much more reliable and produces attractive wines at many different price points. I have always been drawn to Godello, but at the moment I seem to be liking it more and more. What’s more, we are fortunate to have the grape at all, as Godello very nearly went extinct as a consequence of Franco’s agricultural policies – his government guaranteed prices for agricultural goods, wine amongst them. One result of this policy is that as vineyards were replanted they replaced quality grapes with grapes that produced quantity more than anything else. I assume that Rioja and Tempranillo avoided this potential fate as it already had an international market. 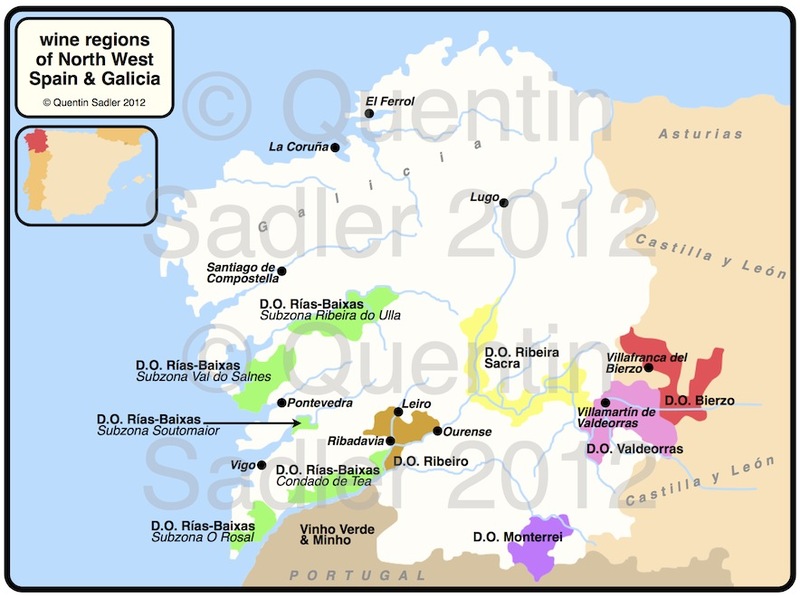 Godello is principally grown in the Valdeorras region of Galicia and Bierzo in Castilia y León – the 2 regions were historically both in Galicia and use the same grape varieties and have broadly the same conditions. Godello is also grown in Monterrei and Ribera Sacra to great effect. Given that it has survived and we can now enjoy Godello, I would love for it to be more popular – and Spanish white wines in general actually, which are often very good quality indeed. Anyway recently I tasted an excellent Godello that was delicious and great value for money, so I made it my Wine of the Week. 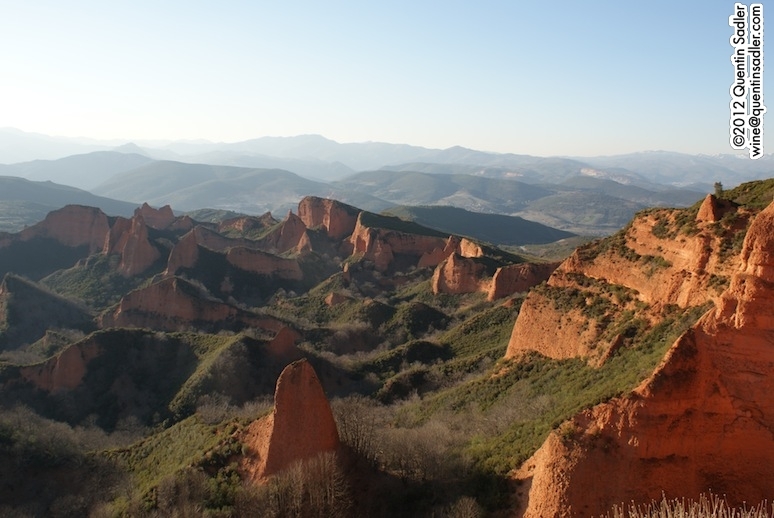 Las Médulas, a World Heritage Site in Bierzo that was once the most important gold mine in the Roman Empire. 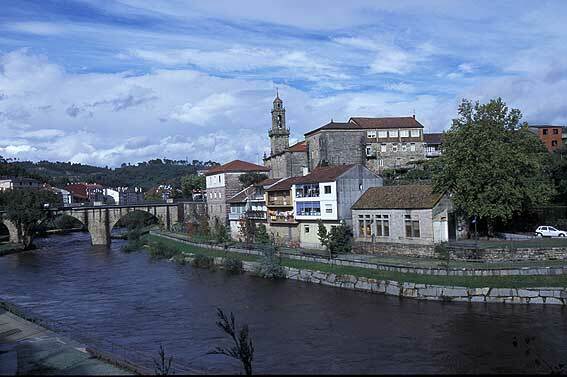 Valdeorras, the Valley of Gold, gets its name form these gold mines. This wine is made by the great Rafael Palacios, whose brother Alvaro is one of the movers and shakers in Spain’s great Priorat region. Rafael fell in love with Godello in 1996, when it was incredibly rare – I think I am right that there were only 7 producers of it in the world by that time – and went on to piece together a 21 hectare estate of Godello grapes in the beautiful Val do Bibei high in the mountains near the village of Bolo. What he fell in love with was the bright, cool Atlantic influence, but also the extra depth and weight that Godello has over the region’s other grape varieties. He was also fortunate in that the vines he managed to get his hands on include some seriously old material, some of it nearly 100 years old. The Bolo Mountain Wine is his straightforward , unoaked take on Godello, he makes 2 more serious examples, but I still think it is a lovely wine. A supremely fresh and lively dry white. It is light and easy to drink, even with a slight petillance on the palate, which I find very enticing. The nose is honeysuckle and gentle peach, while the palate is soft and fresh and reminded me of some of the Swiss wines I was tasting near Montreux the other day. The acidity doesn’t dominate, so there is a softness and creaminess, but it is still very fresh with a core of minerality that gives the wine real poise and elegance. Overall the wine has a real mountain feel, there is a purity about it that I love and what’s more is is sinfully drinkable – 89/100 points. Available in the UK for around £10 a bottle from The Wine Society. More stockist information is available from Indigo Wine. Available in the US for around $12 a bottle, stockist information is available here. I would urge you to try this wine, it is superb quality, great value and very versatile indeed. It is lovely as an aperitif, but equally good with fish, poultry, pork, creamy cheeses and spicy food. I think that I will drink a fair amount of it this Summer. The other day I presented a tasting to Thanet Wine Appreciation Society, I called it the Hidden Gems of Spain, because I had dug deep to find interesting and great quality wines from as wide a range of Spanish wine regions as I could. I really like going to address Thanet as the meetings are so large – there were 120 people there, most wine societies have 30-50. It was great fun and they seemed to really enjoy the wines on show. More satisfyingly the tasting introduced many of them to wines, regions and grapes they had never tried before. I have a sort of theory that many UK consumers expect all Spanish wine to look and taste like Rioja, so – much as I love Rioja – I enjoy showing wines that are as different from Rioja as they can be, in order to show the great diversity of wine produced in Spain. At first the wine society were unsure if they wanted a Spanish tasting, as they had one last year. However, I won them round when I explained that I could make it an annual event and never repeat myself and made sure that I showed nothing at all from the same regions as the previous year’s tasting. In truth my problem was not what to show, but what not to show – I only had six wines plus an aperitif. It is hard to give an overview of how exciting Spain is in seven wines, so I kept pencilling wines in and then crossing them off the list again.